Just when you thought you were reading a blog devoted to whiskey, I pull out a brandy: an American spirit to no lesser degree however. 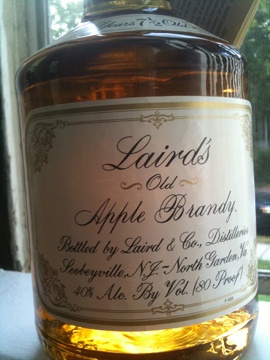 In fact, brandies – specifically apple brandies – have probably been in production in the US longer than grain whiskey of any type has. Colonists in New England distilled hard cider into applejack using the freeze distillation method, resulting in a harsh beverage full of fusel alcohols. Fortunately Warwick Valley Wine Company (NY) does not rely on freeze distillation to make their apple brandy. Rather they use a copper pot still to refine their spirit, much to the drinkers’ advantage. They also age it for one year in New York oak. I’m a little doubtful that such a young bottling will be very interesting, but I am glad to see another product come out of the Northeast. – Made by Warwick Valley Wine Co.
American Fruits Apple Brandy comes in a tall, thin bottle with a lon neck and a bright red plastic cork-handle on the top. Instead of a paper label WVWC frosts the the clear glass, with the exception of the outline of an apple in the center. The front is sparsely decorated with this apple serving as the central adornment. Other than that and the product information, it shows only the name in two simple fonts. The back sports the image of Warwick Valley itself and a paragraph relating the friendships at the core of the WVWC. It comes across as overly sentimental in the way that American wineries can be, but it does get the point across that these guys are a little new to the field of distilled spirits. Also important to note is that nowhere on the bottle do they put an age statement. Sure, one year is nothing to trumpet, but youth affects liquor to a gret degree and it would probably be helpful to many prospective buyers to see the age right on the bottle. American Fruits Apple Brandy smells an awful lot like you’d expect young apple brandy to smell like: recently distilled alcohol and apples, cider specifically. It hasn’t spent enough time in the barrel to come into its own or pick up anything significant from the wood. On tasting the impression is much the same. As with any spirit so young, the immediate impression is that of the alcohol. That said, it is not overly harsh and rather smooth compared to something like Georgia Moon. Perhaps those 12 months did some good after all. Following this initial sensation, it settles into a pleasant, clean, apply finish that is surprisingly long. This is a good start for the WVWC, but clearly their apple brandy is too young to have anything approaching complexity or depth. It will be interesting to watch as they come out with an older variety – perhaps a six or four year? These might begin to reveal their full potential.